London Roads is a fun nine patch quilt block to make because you can experiment with colour placement to get a variety of outcomes. In the sample block, some of the rectangle and triangle pieces appear to make an arrow pointing in the direction the quilter wants you to look. You could also try out using more or less fabric selections to render a totally different look. 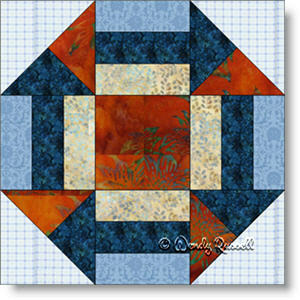 This quilt block is an easy block comprised of rectangles, squares, half square triangles and quarter square triangle pieces, so you get lots of practice using several different shapes. The sample illustrations show just how much of an impact colour can have on your quilt as an end product.